Isaac Frank Wallace (1856-1925) was clearly related to Everet Wallace. He lived very close to and was very connected to a number of Isham Wallace's sons. My grandfather, Mallie Wallace, remembered Frank and said that his grandfather, Emsley Wallace, had told him that Frank was an illegitimate child of one of Isham's sons. In his 1902 voter registration, he listed "Lock Wallace" as his ancestor who voted on or prior to 1867. Mr. George M Wallace of Carthage, N.C. and Miss Mary Muse of Carthage, NC on December 23, 1886 at D.F. Muse's by Wayne King. Witness by I.F. Wallace and John Horner. I.F. 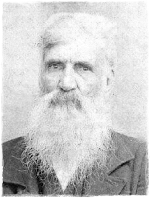 Wallace, age 47, resident of Columbia Township registered to vote stating that his ancestor Lock Wallace had voted in the state of NC on or before Jan 1, 1867. Ramseur, Sept. 7 -- On Monday funeral services were held at the Baptist Church by Rev. W.A. Elam for Frank Wallace, aged about 75 years, who died at his home in Danville, VA, following a stroke of paralysis. Mr. Wallace was a former resdient of Ramseur, but for the past several years had made his home with his daughter, Mrs. M. Coward at Danville. He was a member of the Baptist Church and a member of the Junior Order. He was a kind, Christian gentleman, a good father and companion and had made many friends in Ramseur and community during his life. He reared a large family, many of which have already preceded him to the grave, including his wife.